Sooty blotch and fly speck are two different diseases. Both diseases are widespread throughout the Midwest, and commonly occur together on the same fruit. Figure 1. Severe sooty blotch on Golden Delicious apples. Figure 2. Fly speck on apple fruit. 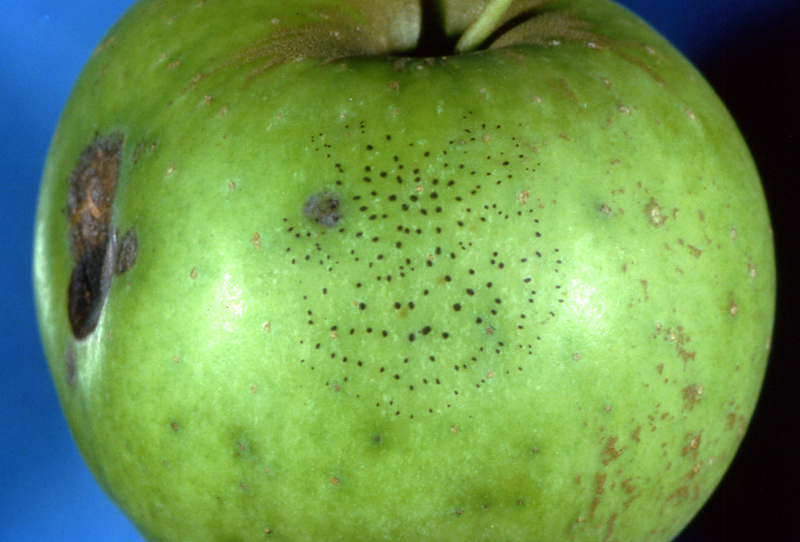 Sooty blotch and fly speck cause a discoloration or blemish of near-mature fruit. The discoloration is superficial, and while neither disease actually damages the fruit, the presence of disease reduces the grade and market value of the fruit. Although all apple varieties are susceptible to infection by both fungi, symptoms are most severe on yellow or light-colored varieties such as Golden Delicious or Grimes. Both diseases are most common during years with a cool, wet spring, rains in late summer, and low temperatures in early fall. Brown to dull black, sooty blotches with an indefinite outline form on the fruit surface. Blotches may be ¼ inch in diameter or larger. The blotches may coalesce to cover practically the entire fruit. The sooty blotch fungus is restricted to the outer surface of the fruit, and in many cases the blotches can be easily rubbed off. However, if infection occurs early in the season, you may need to rub or bleach the fruit vigorously to remove it. Groups of six to 50 or more black and shiny round dots that resemble fly excreta appear on the surface of the fruit. The individual “fly specks” are clearly separated and can be easily distinguished from sooty blotch. Like sooty blotch, fly speck infections are superficial; however, they are usually harder to rub off than sooty blotch. Sooty blotch is a disease complex caused by a large number of different fungi. Fly speck is caused by Zygophiala jamaicensis. Both fungi overwinter on twigs of various wild woody plants, especially wild blackberry and raspberry canes. Both fungi require free water on the fruit surface to infect. 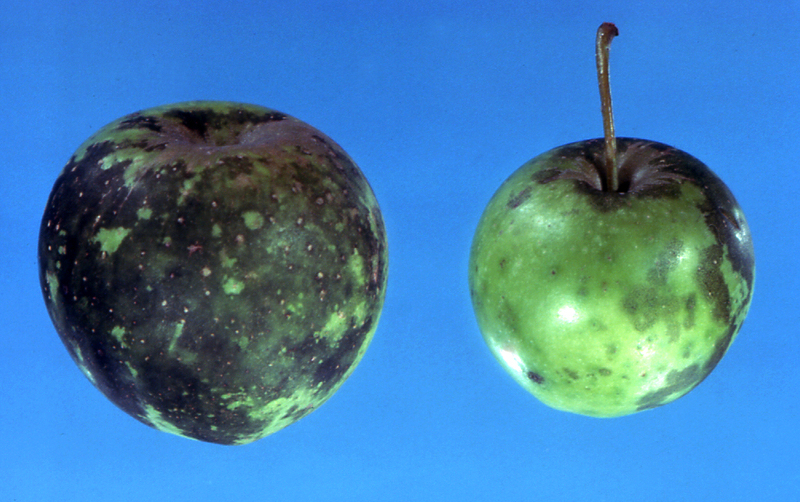 The “sooty blotch” or “smudge” appearance on affected fruit results from the presence of hundreds of minute, dark fungal fruiting bodies (pycnidia) that are interconnected by a mass of loose, interwoven dark hyphae (fungal filaments). In spring, pycnidia on wild plants produce large numbers of spores (conidia) that ooze out and collect in a gelatinous mass. The conidia are then spread by water splash or wind blown mists into orchards from late May or early June until fall. The fungus first affects apple twigs, then secondary colonies are initiated on the fruit. Cool, humid weather (optimum 65 degrees F or 18 degrees C) is essential for disease development. The disease does not develop when temperatures reach 85 degrees F (30 degrees C). When May and June are cool and moist and are followed by a hot July and August, sooty blotch symptoms often do not appear for two to three months. The disease is absent or rare when hot, dry weather prevails until close to harvest time. The disease is most severe when cool, rainy weather in the spring is coupled with late summer rains and low temperatures in early fall. Under ideal conditions, the incubation period from the time the fungus reaches the fruit to the appearance of symptoms may be as short as five days. In the orchard, the incubation period usually lasts three to four weeks on fruits that are 42 to 45 days old. The individual “fly specks” are sexual fruiting bodies (ascocarps) of the fungus. Starting in late spring, the fungus produces spores on wild hosts. These spores are carried by wind into the orchard. When spores come into contact with the fruit under the proper environmental conditions, they germinate and infect. Symptoms can develop within 15 days under favorable environmental conditions (65 degrees F or 18 degrees C). Select an orchard site that always has full sunlight, good air circulation, and good soil (water) drainage. Prune trees annually to an open center for maximum air circulation. Both diseases are most prevalent in the damp, low, shaded areas of the orchard. Any practice that opens up the trees to greater air movement and promotes faster drying greatly aids in control. Remove or destroy nearby wild or neglected apple trees. Backyard growers should remember that the disease is superficial and rarely affects the quality of the fruit. Removal of the fungus by washing, rubbing, or peeling the fruit results in fruit that is acceptable for cooking or eating fresh. Especially in commercial plantings, fungicide sprays are important for controlling these diseases. For the most current fungicide recommendations, commercial growers are referred to Bulletin 506, Midwest Fruit Pest Management Guide. Backyard growers are referred to Bulletin 780, Controlling Diseases and Insects in Home Fruit Plantings. These publications can be obtained from your county Extension office or the CFAES Publications online bookstore at estore.osu-extension.org.